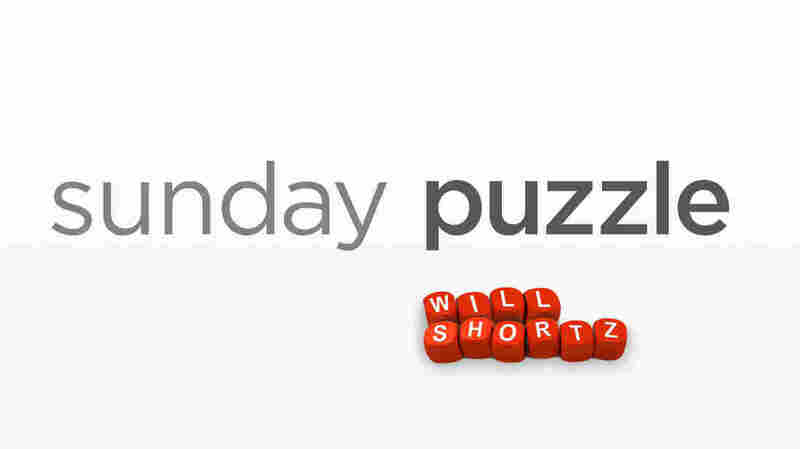 Sunday Puzzle: Beach Games NPR'S Lulu Garcia-Navarro and puzzle master Will Shortz play the puzzle with a surprise guest: Gene Demby of NPR's Code Switch. On-air challenge: I've brought a game of Categories based on the word BEACH. For each category I give, name something in it starting with each of the letters B-E-A-C-H. For example, if the category were "Girls' Names," you might say Betty, Emma, Abigail, Chloe, and Hannah. Any answer that works is OK, and you can give the answers in any order. Last week's challenge: We're in the middle of a two week challenge, please see the challenge below. Next week's (two-week) challenge: We're in the middle of a two-week creative challenge. The object is to pitch an idea to one of the networks, either broadcast or cable, in which your show's title is just one letter different from an existing show's title, past or present. Name your TV show and summarize it in 15 words or less. Entries will be judged on their sense, naturalness of wording, humor and overall effect. No more than three entries per person, please. The person who sends the best TV pitch, in my opinion, will play the on-air puzzle this week. If you know the answer to next week's challenge, submit it here. Listeners who submit correct answers win a chance to play the on-air puzzle. Important: Include a phone number where we can reach you Thursday, June 14 at 3 p.m. ET.